General Electric (Ticker “GE”) Fortune Magazine World’s Most Admired Companies at rank 11. GE is the single surviving company from the 1896 Dow Jones Industrial Index and currently has roughly 305,000 employees and over 140 billion dollars in revenue last year [GE 10-K for the year ending March 31, 2013]. I believe it is safe to say these guys know what they are doing. They are in the business of designing and manufacturing appliances plus energy, health, aviation, and transportation equipment in addition to operating a financial services company. Due to GE’s aggressive and hard pressed past, there are very few companies with the same or even similar brand recognition, especially as they have had such a long standing track record. 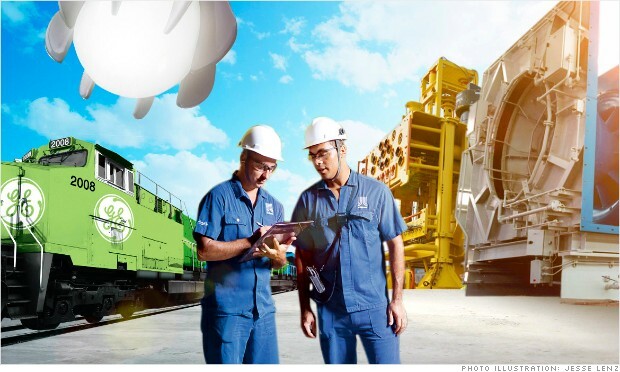 Though a mammoth company, GE too had troubles fighting down turns in 2008. GE’s financial services wing, GE Capital, found itself holding just about half of GE’s profits. GE Capital was having difficulties and thus GE had to cut its dividend which was a huge blow to its image. All of this finance/business aspect of the company then affected how GE would then change its ways operationally. GE realized it needed to simplify, and was most definitely a task involving and most reliant on its operations management team. Most interesting for me was the refocus on a portfolio of the company to refocus on its traditional core industries. That is, they are now going to focus and dominate at what they are good at. For example, in 2012 GE began to make water heaters which was its first new product in 50 years. The site that it was built on was named Appliance Park, KY (notice any connection?) though this site had been used less and less due to favorable overseas factories which were much cheaper. Interestingly, in 2009 GE shifted toward moving those overseas jobs back into the domestic light. This process is just being finalized and in full swing. The result? A cheaper and much more rapid production thanks to an efficient domestic supply chain perfected by the company. Another interesting note about this company’s changes: GE is spending money on investments in the “industrial internet” in order to take hold of ‘big data’ to make more efficient machines. -How do you think GE asses’ its ‘utilization’ and ‘efficiency’ for its production facilities now that there is a fully implemented shift into domestic production for this large company. -We discussed in our course lecture the concept of ‘planning over a time horizon’. How do you think GE will have to change the way it plans its capacity or the upper limit or ceiling on the load that an operating unit can handle? -We have seen virtually all large companies using automation and focusing on capacity. We just discussed this in the course lecture last week. How do you think GE’s focus on investing in the “industrial internet” will change the efficiency of their production machines? Do you think this will be a drastic change? Something they won’t see for a long period of time? Are ethical dilemmas an issue for operational management? If your answer is no, you are wrong. There are many ethical dilemmas that companies face each day regarding their operations. This Bloomberg article regarding an ethical decision needed to be made by Tokyo Electric Power Company (or ‘TEPCO’) , a Japanese electric utility company, is ground shaking with the large implications that will result per their ultimate decision. From within the seven pits, leaks were found in the basements from when the disaster teams were called in to cool down the reactors. The company is now under pressure because it may be forced to dump the radioactive water in the Pacific Ocean. Time is of the essence due to the water busting through basement walls at roughly 400 tons per day. This water is then becoming contaminated, thus a huge issue. TEPCO has two operational decisions to make to pass down to its work crew: reduce radiation levels from the water by pouring it into the Pacific Ocean or continue their production of “above-group storage tanks”. Why such a tough decision for management? It is essentially impossible to keep up with the inflow of water that is leaking. Even with production of 450,000 tons of the tanks above ground by September 2013 and 700,000 tons by the middle of 2015 this company clearly is fighting an uphill battle. What are the effects of their decisions? Well, an important factor in this are human lives. The United Nations Scientific Committee on the Effects of Atomic Radiation (or ‘UNSCEAR’ link to their website here –> http://www.unscear.org/) has remarked that humans can get cancer, such as leukemia, with moderate to high levels of exposure to the toxins. Even though TEPCO is working on the removal of many of the radioactive substances, the purification system they have created continues to see operational issues in functioning properly. The company’s image continues to be at stake, they face legal issues, disrupting the fishing industry, and their company’s attractiveness to investors in the future. Other than the business side, their obligated to think of their own people as in their workers and also those people that this could affect. The original cause of the leaks could have potentially been a flaw in the staffs proper inspection of the equipment and additional tests before dumping toxic water into the leaking pits. This is an operational nightmare for TEPCO. I feel that this story directly related to what we have already learned within class. Within the puppet making exercise the workers continued to feel pressured by upper management to just get the job done. Also, within the tower exercise having an effective team leader was crucial along with the planning phase of construction. I am curious to hear your thoughts on what truly caused these leaks and what you would do in this situation.